Celebrating the unveiling of the new Susquehanna County Heritage Attractions sign in Forest City on Nov. 1 were (above, front, from left) Sen. Lisa Baker, Susquehanna County Commissioner Betsy Arnold, PA Rail-Trails representatives Lynn Conrad, Craig Benson, and Deb McNamara, former Forest City mayor Frank Brager, (back) 111th District candidate for senator Jonathan Fritz, Greater Forest City Business Alliance member Joy Zazzera, EMHR board members Rick Hiduk, Ed Zygmunt, and Bobbi Jo Turner, EMHR past president Alice Deutsch, and Karen Allen, Susquehanna County Housing & Redevelopment Authority. Sen. Lisa Baker (top photo) addresses the crowd gathered in Forest City on Nov. for the unveiling of two new signs, including the Susquehanna County Heritage Attractions sign at right. Nearly 50 people gathered on Main Street in Forest City on Nov. 1 for the unveiling of two new signs and a celebration of the partnership that turned a routine project into a big deal for a little town at the edge of the Endless Mountains. The project is the result of months of planning by several entities with related missions. With funding assistance from the Susquehanna County Room Tax Committee and Endless Mountains Visitors Bureau (EMVB) and PA DCNR, the Endless Mountains Heritage Region (EMHR) developed the Susquehanna County Attractions sign. Forest City Borough and the PA Rail-Trail Council were key partners. The Greater Forest City Business Alliance (GFCBA) developed and produced a separate sign panel for the reverse side. The two signs were installed in the parking lot across from Zazzerra’s Supermarket. The Susquehanna County Heritage Attractions sign that faces Main Street is the third of its kind produced by the EMHR, which plans to expand the effort into other Heritage Region historic downtowns and Sullivan County. EMHR has placed similar signs in Bradford and Wyoming counties in Towanda and Tunkhannock, respectively. Each features a map and legend with details about dozens of museums, parks, scenic byways and trails, and parks in the respective counties. 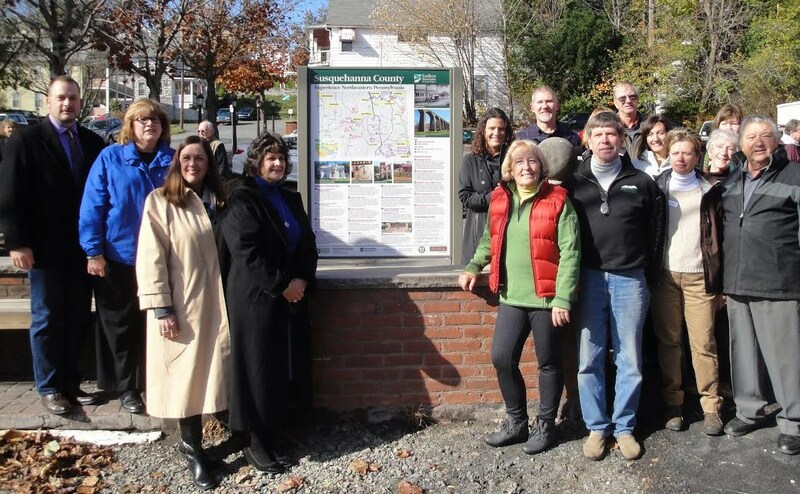 The Greater Forest City Business Alliance and PA Rail-Trails Council worked together to produce and fund the production of a sign that highlights the business districts of Forest City and nearby Vandling and Browndale. It is an updated version of one placed last year at the D&H Rail Trail head, the trail being featured on both signs. Attendees included GFCBA members and managers of numerous sites featured on the Susquehanna County map. EMHR board president Ed Zygmunt, State Sen. Lisa Baker, PA 111th District candidate for representative Jonathan Fritz, Susquehanna County Commissioner Betsy Arnold, Forest City Mayor Pauline Wilcox, GFCBA president Joy Zazzerra, D&H Rail-Trail executive director Lynn Conrad, and EMVB director Jean Ruhf. EMHR often works in partnership with local and regional organizations to develop projects that strengthen communities. But the project in Forest City evolved into a solid collaboration between more parties than usual and exceeded initial expectations. Sen. Baker extolled the value of cooperation, especially in small town Pennsylvania. Fritz remarked that the unique collaboration between nonprofit and business organizations, municipalities and state agencies was refreshing in the face of a divisive election year. “When we all work together, we can accomplish amazing things,” Fritz stated. Several people in attendance expressed an interest in obtaining replicas of the sign, and Schultz related that orders will be solicited soon for a bulk order. Replicas can also be produced as vinyl or fabric banners that can be used as backdrops at special events. For more information, contact EMHR at 570-265-1528 or hrobinson@emheritage.org. Flanking the new Greater Forest City Business Alliance sign are (from left) Nick Cost, borough council member; mayor Pauline Wilcox, Chris DeGonzague, council member; Joy Zazzera, GFCBA; Annette Schultz, Endless Mountains Heritage Region; Melissa Rushworth, GFCBA; Paul Daugevelo, GFCBA; Erin Debish, GFCBA; Michael O’Neill, GFCBA; Deb McNamara, PA Rail-Trails Council.